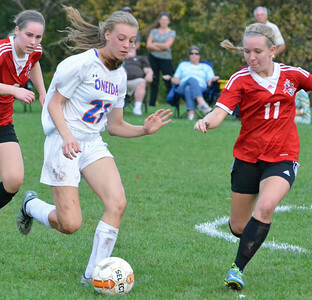 Photos from Oneida's 2-1 overtime victory over Vernon-Verona-Sherrill in the first round of the Section III Class B playoffs in Oneida on Tuesday, Oct. 18, 2016. 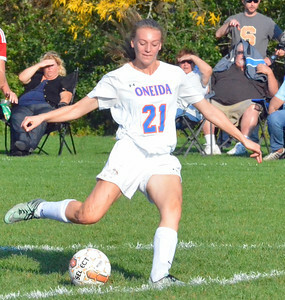 KYLE MENNIG - ONEIDA DAILY DISPATCH Oneida's Sarah Paul (21) prepares to take a shot against Vernon-Verona-Sherrill during their Section III Class B playoff match in Oneida on Tuesday, Oct. 18, 2016. Paul scored on the play. 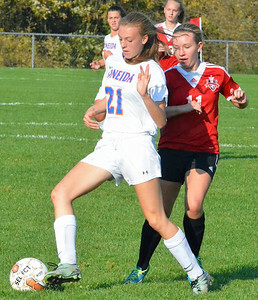 KYLE MENNIG - ONEIDA DAILY DISPATCH Oneida's Sarah Paul (21) cuts in front of Vernon-Verona-Sherrill's Marriah Doig (11) to take the ball during their Section III Class B playoff match in Oneida on Tuesday, Oct. 18, 2016. 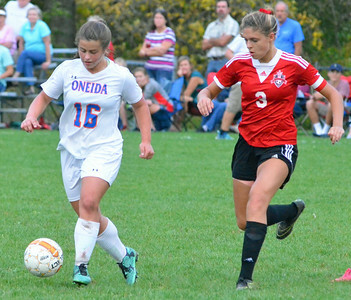 KYLE MENNIG - ONEIDA DAILY DISPATCH Vernon-Verona-Sherrill's Marriah Doig (11) traps the ball near the sideline as Oneida's Kayla Suppa (16) moves in to defend during their Section III Class B playoff match in Oneida on Tuesday, Oct. 18, 2016. 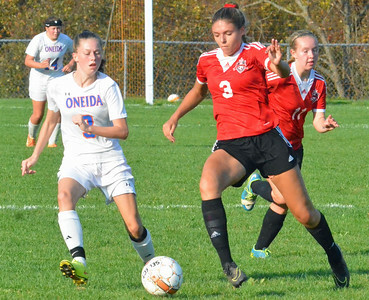 KYLE MENNIG - ONEIDA DAILY DISPATCH Vernon-Verona-Sherrill's Katja Meyer (3) moves with the ball as Oneida's Jenna Ford (3) defends during their Section III Class B playoff match in Oneida on Tuesday, Oct. 18, 2016. 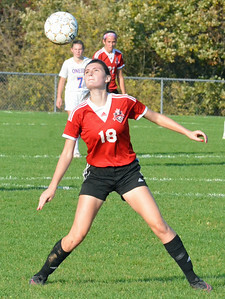 KYLE MENNIG - ONEIDA DAILY DISPATCH Vernon-Verona-Sherrill's Sarah Wayland-Smith plays the ball out of the air against Oneida during their Section III Class B playoff match in Oneida on Tuesday, Oct. 18, 2016. KYLE MENNIG - ONEIDA DAILY DISPATCH Oneida's Victoria Borders (11) brings the ball up the sideline as Vernon-Verona-Sherrill's Emily Rossi (20) in their Section III Class B playoff match in Oneida on Tuesday, Oct. 18, 2016. 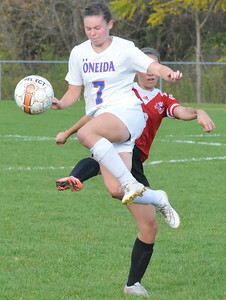 KYLE MENNIG - ONEIDA DAILY DISPATCH Oneida's Nicole Smith (7) collides with Vernon-Verona-Sherrill's Emma Lehmann (8) as she jumps to play the ball during their Section III Class B playoff match in Oneida on Tuesday, Oct. 18, 2016. 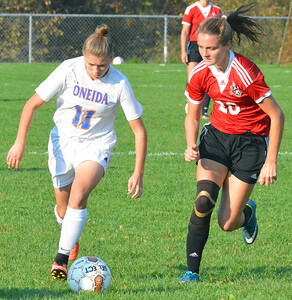 KYLE MENNIG - ONEIDA DAILY DISPATCH Oneida's Rachel DeRuby (20) dribbles the ball away from Vernon-Verona-Sherrill's Abbey D'Agostino (17) during their Section III Class B playoff match in Oneida on Tuesday, Oct. 18, 2016. 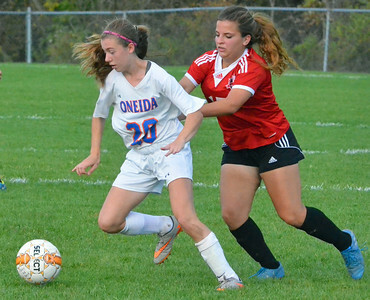 KYLE MENNIG - ONEIDA DAILY DISPATCH Vernon-Verona-Sherrill's Emma Lehmann (8) controls the ball as Oneida's Kirsten Barrett (13) defends during their match in Verona on Thursday, Sept. 29, 2016. 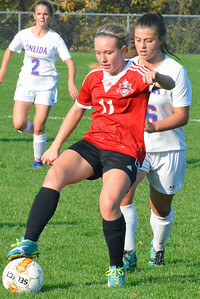 KYLE MENNIG - ONEIDA DAILY DISPATCH Vernon-Verona-Sherrill's Katie Musacchio (22) moves the ball towards the goal as Oneida's Julia Abel (6) defends during their match in Verona on Thursday, Sept. 29, 2016. 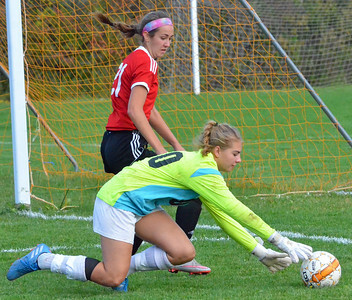 KYLE MENNIG - ONEIDA DAILY DISPATCH Vernon-Verona-Sherrill's Alexa Kiser (21) heads the ball on a corner kick as Oneida keeper Liz Rice reaches for it during their Section III Class B playoff match in Oneida on Tuesday, Oct. 18, 2016. 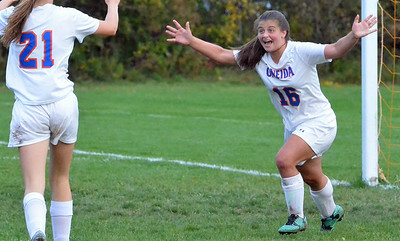 KYLE MENNIG - ONEIDA DAILY DISPATCH Vernon-Verona-Sherrill's Alexa Kiser (21) reacts after scoring a goal against Oneida during their Section III Class B playoff match in Oneida on Tuesday, Oct. 18, 2016. 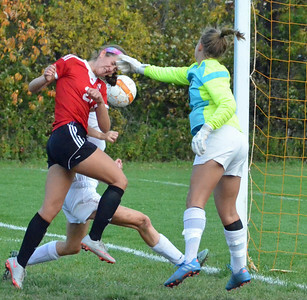 KYLE MENNIG - ONEIDA DAILY DISPATCH Oneida keeper Liz Rice dives on the ball in front of Vernon-Verona-Sherrill's Alexa Kiser (21) during their Section III Class B playoff match in Oneida on Tuesday, Oct. 18, 2016. 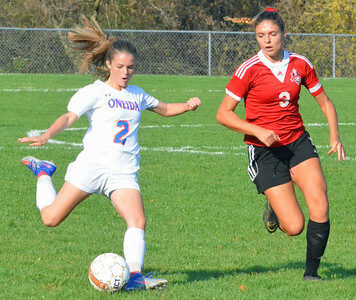 KYLE MENNIG - ONEIDA DAILY DISPATCH Vernon-Verona-Sherrill's Emily Rossi (20) kicks the ball upfield past Oneida's Julia Abel (6) during their Section III Class B playoff match in Oneida on Tuesday, Oct. 18, 2016. 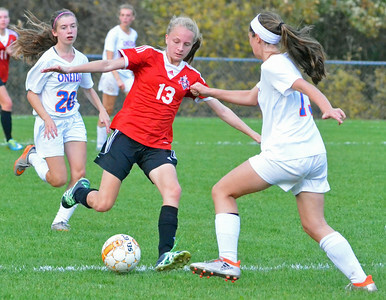 KYLE MENNIG - ONEIDA DAILY DISPATCH Vernon-Verona-Sherrill's Meghan Starke (13) kicks the ball as Oneida's Kirsten Barrett (13) defends during their Section III Class B playoff match in Oneida on Tuesday, Oct. 18, 2016. 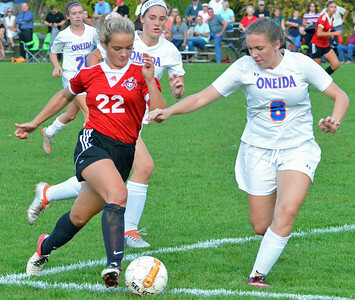 KYLE MENNIG - ONEIDA DAILY DISPATCH Oneida's Kayla Suppa (16) and Vernon-Verona-Sherrill's Sarah Wayland-Smith (18) battle for control of the ball during their Section III Class B playoff match in Oneida on Tuesday, Oct. 18, 2016. KYLE MENNIG - ONEIDA DAILY DISPATCH Oneida's Sarah Paul (21) dribbles the ball as Vernon-Verona-Sherrill's Marriah Doig (11) defends during their Section III Class B playoff match in Oneida on Tuesday, Oct. 18, 2016. 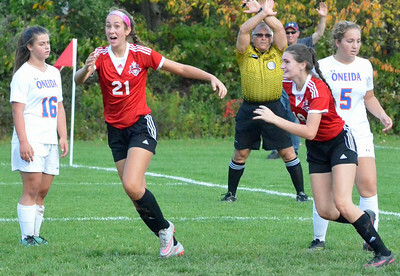 KYLE MENNIG - ONEIDA DAILY DISPATCH Oneida's Kayla Suppa (16) and Sarah Paul (21) celebrate after Suppa's overtime goal against Vernon-Verona-Sherrill in their Section III Class B playoff match in Oneida on Tuesday, Oct. 18, 2016. 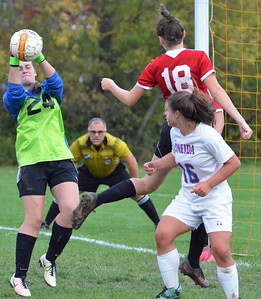 KYLE MENNIG - ONEIDA DAILY DISPATCH Vernon-Verona-Sherrill keeper Samantha Bentley (24) parries the ball following an Oneida corner kick during their Section III Class B playoff match in Oneida on Tuesday, Oct. 18, 2016. 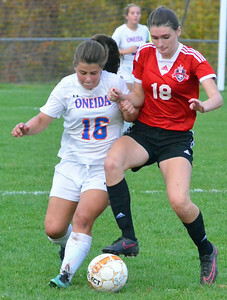 Looking on are Oneida's Kayla Suppa (16) and VVS' Sarah Wayland-Smith (18). 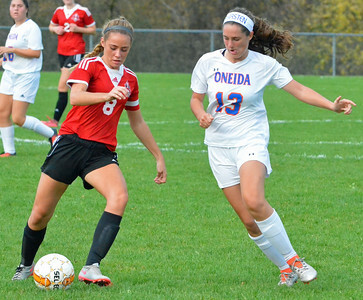 KYLE MENNIG - ONEIDA DAILY DISPATCH Oneida's Kayla Suppa (16) possesses the ball as Vernon-Verona-Sherrill's Katja Meyer (3) moves in to defend during their Section III Class B playoff match in Oneida on Tuesday, Oct. 18, 2016. 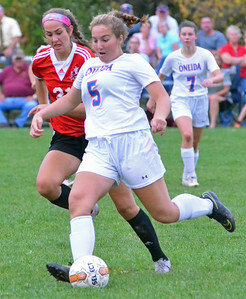 KYLE MENNIG - ONEIDA DAILY DISPATCH Oneida's Gabrielle Cafalone (5) kicks the ball up the field away from Vernon-Verona-Sherrill's Alexa Kiser (21) in their Section III Class B playoff match in Oneida on Tuesday, Oct. 18, 2016. 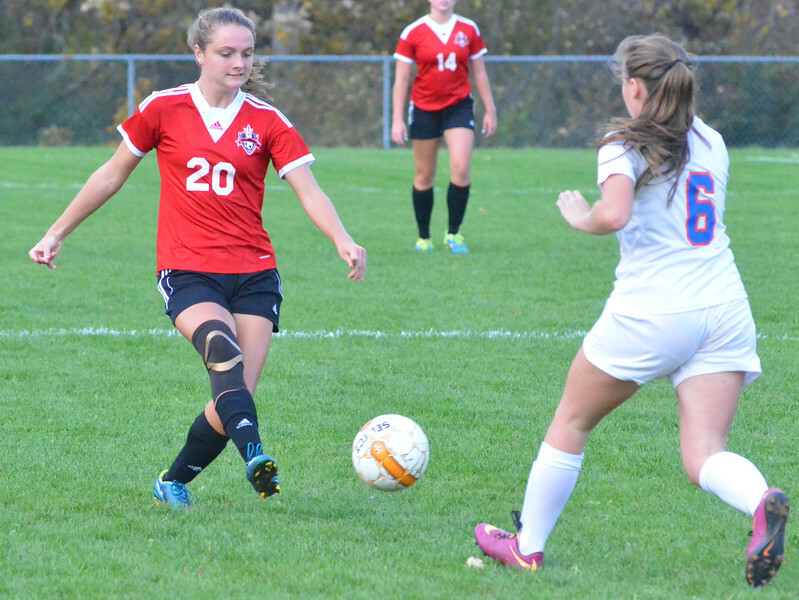 Vernon-Verona-Sherrill's Emily Rossi (20) kicks the ball upfield past Oneida's Julia Abel (6) during their Section III Class B playoff match in Oneida on Tuesday, Oct. 18, 2016.